A Colorado surgeon is being investigated for botching at least 11 surgeries at a Denver hospital. Accusations against Dr. Warren Kortz, a surgeon at Porter Adventist Hospital in Denver, include leaving sponges and surgical equipment in patients and improperly using robotic surgery tools for kidney "procedures," CBS Denver reported. The Colorado Medical Board has filed 14 counts of unprofessional conduct against the doctor, some of which stem from the robotic surgeries. 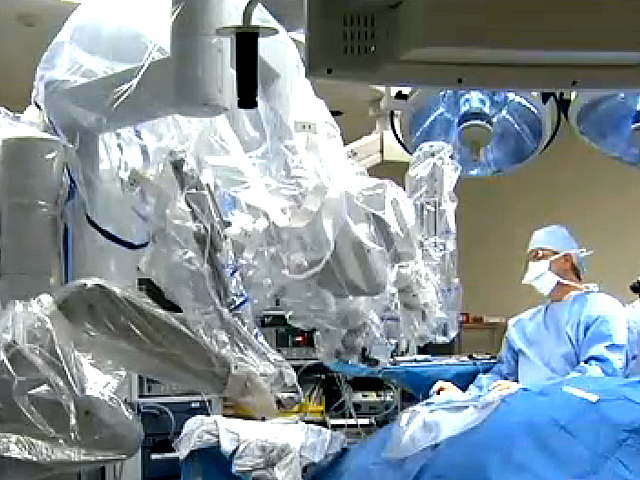 The hospital began using the da Vinci Robot beginning in 2008 and the doctor was placed under suspension in 2010 after complications from 11 kidney surgeries, according to CBS Denver. The da Vinci system has been on the market since 2000, and includes a three- or four-armed robot that surgeons operate with hand controls at a computer station located several feet away from the patient, the Associated Pressreported previously. The device allows surgeons to see inside the patient's body through a tiny video camera attached to one of the long robot arms. The other arms are equipped with tiny surgical instruments. The multi-million dollar robot has gained recent attention from the Food and Drug Administration, which is investigating the surgeries amid increases in reports of adverse events, freak accidents and at least five deaths from the procedure since January 2012. Some incidents included the robots nicking blood vessels and perforating organs. Da Vinci is the only robotic system cleared for soft-tissue surgery by the FDA. Kortz used the robotic devices for kidney transplants. A pending lawsuit against the doctor accused him of misrepresenting the success rate of the machine by telling patients "the safest, best option for them was the robot." He is also accused of not offering standard non-robotic surgical options for patients, CBS Denver added. In several of the cases, Kortz had to resort to manually surgery after injuring patients with the robot. One elderly patient suffered a torn aorta and had to be taken off life support. Others suffered nerve damage and internal bleeding. Robotic hysterectomies on the rise, says study: But are the costlier surgeries better? Kortz is accused of injuring these patients through improper padding and positioning, and subjecting some patients to overly long surgeries, the Denver Post reported. He also failed to document theses errors in medical charts. He had to abort kidney donations because of mistakes, the paper added. Kortz was interviewed in 2009 by CBS 4 in Denver, when he told cameras he was convinced that the robots were the future of surgeries. "I'm sure a day will come where perhaps the robot has a technical failure. I'd be hard-pressed to say, 'I think we need to cancel.' We could go back to the old technology but I don't think that's right," he said in that interview. Lisanne Leasure, an attorney for Kortz in a negligence suit from one of the kidney patients, said in a statement to the Post that the doctor's care was "reasonable and appropriate." She called Kortz a "very experienced and excellent surgeon who has helped many Coloradans over his lengthy career." The attorney representing him on state medical charges declined to comment. The da Vinci is used for operations that include removing prostates, gallbladders, transplanting organs, repairing heart valves and weight loss surgeries. The surgeries have been on the rise, according to the Associated Press: Last year there were 367,000 robot surgeries versus 114,000 in 2008, da Vinci's maker, Intuitive Surgical Inc. of Sunnyvale, Calif., told the AP. Some adverse reports the AP reported include a woman who died during a 2012 hysterectomy, a Chicago man who died during a 2007 spleen surgery, a robotic arm that hit a patient during the face during a procedure, and a robot that had be shutdown during colon surgery after it wouldn't let go of tissue (that patient was not injured). Intuitive Surgical disputed that there's been a true increase in problems and says the rise reflects a change it made last year in the way it reports problems. Company spokeswoman Angela Wonson told the AP the da Vinci "has an excellent safety record with over 1.5 million surgeries performed globally, and total adverse event rates have remained low and in line with historical trends."